2 Depto. de Química Inorgánica, Facultad de Química, Universidad Nacional Autónoma de México, Circuito Exterior s/n, Ciudad Universitaria, D.F., México 04510, México. 3 Instituto de Geofísica, Universidad Nacional Autónoma de México, Circuito Exterior s/n, Ciudad Universitaria, D.F., México 04510 México. Desorption kinetics of tetraethyl lead, under changing pH and controlled temperature, Eh and dissolved oxygen, in a miningimpacted Mexican tropical river, was examined using samples placed in a closed system. The objective of this study was to determine the potential environmental risk for local residents from the tetraethyl lead present in the water column. Statistical and geochemical methods elucidated the potential environmental threat of free tetraethyl lead (TEL). Specifically, analysis of water samples from three stations in the Taxco River basin indicated that altering pH caused significant changes in the concentration of TEL in the water column. Since this study was performed on a closed controlled system that contained sediments and water from the river, desorption from sediments caused by changing pH is the mechanism by which TEL increases in the river water. Since the samples used for this study are natural samples collected in the river, it is assumed that this behavior could be expected in the river if a suddenly decrease in pH occurs. It is probable that the processes of TEL desorption depend on several variables, since fitted curves, for changes in TEL release with time, go from linear (direct relationship) to polynomial (colinearity) suggesting a complexity of interacting factors. Therefore, factor analysis was used to tease out how the geochemical characteristics of sediments and pH interact to control TEL concentration's changes. Factor analysis showed that the most probable sources of TEL present in the Taxco River basin, are wet deposition, runoff, and leaching of the hydrological basin. TEL in situ microbial formation is probably not a source in this particular area. In the sample taken from a station near a tailing and an active mine, TEL concentrations at pH 6.0 exceeded the recommended safe limit established by the US EPA (4.6 x 107 mol m3) and as a result could represent a potential environmental risk for local residents. Key words: México, Taxco, tetraethyl lead, kinetics, mining pollution, factor analysis. Se estudió la cinética de desadsorción del tetraetilo de plomo (TEL) dentro de un sistema cerrado, bajo condiciones de pH variable y con temperatura, Eh y oxígeno disuelto estables, utilizando muestras naturales de un río tropical mexicano impactado por desechos mineros. El objetivo de este estudio fue determinar el riesgo ambiental potencial que el tetraetilo de plomo representa para los habitantes del área, utilizando como herramientas de análisis la geoquímica y la estadística multivariada. El análisis de la muestra de agua de tres estaciones en la cuenca del río Taxco indicó que las variaciones de pH causaron cambios significativos en la concentración de TEL presente en la columna de agua. El utilizar un sistema cerrado con muestras naturales, permitió mostrar que el mecanismo a través del cual la concentración de TEL incrementa en el agua al disminuir el pH probablemente es la desadsorción desde los sedimentos. Debido a que las muestras utilizadas para este estudio son muestras naturales, se puede esperar que este mismo comportamiento se repita en el caso de presentarse una disminución de pH en el agua de la cuenca. Es probable que el incremento en la concentración de TEL en el agua para un tiempo determinado dependa de una compleja interacción de diferentes variables, ya que los ajustes de curvas realizados van de lineales (interacción directa) a polinomiales (colinealidad). Por lo anterior, se llevó a cabo un análisis de factores para elucidar cómo interactúan las características geoquímicas de los sedimentos y el pH para controlar los cambios de concentración del TEL. Así también, el análisis de factores mostró que las probables fuentes de TEL en la cuenca del río Taxco son la depositación húmeda, escorrentía y lavado de la cuenca hidrológica. La formación in situ de TEL parece no ser una fuente en esta área. En la muestra tomada en la estación cercana a los jales mineros y a la mina activa, las concentraciones de TEL a pH 6.0 excedieron los límites recomendados establecidos por la US EPA (4.6 x 107 mol m3) y representan un riesgo potencial ambiental para los residentes de la zona. Palabras clave: México, Taxco, tetraetilo de plomo, cinética, contaminación por minería, análisis de factores. The impact of mining in México comes mainly from solid and liquid wastes released into the environment (Armienta et al. 2003). Acid mine drainage (AMD) is a liquid waste formed in tailings containing high concentrations of metals in solution. It may be counted as a principal potential pollutant in aquatic systems because it promotes a decrease in natural pH, alters Eh (oxidation/reduction potential), and affects conductivity (Ritcey 1989, Sangupta 1993, Vanderlinden et al. 2006). Mines and tailings are weathered over time, releasing potential pollutants such as organic lead compounds (Rhue et al. 1992). In a mining area, expected lead concentrations in soils are high (above 150 x 103 g kg1 according to RAIS 2000). Under appropriate conditions, alkylation of lead through purely chemical processes occurs (e.g., Jarvie etal. 1975, Walton etal. 1988, Rhue etal. 1992). Lead alkylation via microorganisms such as sulfate reducing bacteria, present in these types of environments, is also expected since they are able to convert inorganic forms to organic derivatives (Schmidt and Huber 1976, Huber and Kirchmann 1978, Jarvie et al. 1983a, Gilmour and Henry 1991, Pongratz and Heumann 1999). The reverse process, in which organic forms of lead are converted into inorganic forms, has been reported by Gallert and Winter (2004). A common product of chemical and biological alkylation of mine wastes is tetraethyl lead (TEL), a highly hydrophobic compound. It is considered toxic because it can penetrate membranes and skin, and it attacks the nervous and endocrine systems (Gallert and Winter 2002); although some bacteria can survive and even flourish in the presence of TEL (Teeling and Cypionka 1997). In situ formation of TEL in natural systems has been reported (Jarvie etal. 1983b, Hewitt and Harrison 1986), but it remains an issue of debate in the literature (e.g., Pelletier 1995). Radojevic and Harrison (1987) demonstrated that R4Pb compounds are degraded to R3Pb+ and R2Pb2+, and in aquatic systems the alkylated species include methyl, ethyl, or both groups. The principal factors involved in lead methylation in soils and sediments, are the acidity of the environment, the organic carbon content, and the sulfate concentration. The main intracellular donors used by organisms to accomplish methylation are methyl cobalamine, methionine, dimethyl bpropiothein, tetrahydrofolic acid, and Sadenosyl methionin. In addition, the main intracellular donors include polyfunctional halocarbon centers, and products of cellular excretion such as acetate, propionate, and other inorganic acids (Brinckmann and Olson 1987). Although the use of leaded gasoline, in which the main antiknocking agents were tetraethyl lead (TEL) (Mulroy and LiTse 1998) and tetramethyl lead (Nevenka and Branica 1994), was prohibited worldwide (in México in the 1990s), their degradation products such as triethyl lead and trimethyl lead are still ubiquitous in the environment (Blais and Marshall 1986, Radojevic and Harrison 1987, Van Cleuvenbergen et al. 1990, Unob et al. 2003). Wet deposition of atmospheric TEL and its posterior leaching to the river could be an additional source in the study area. According to a number of researchers (e.g., Rashid and Leonard 1973, Wilkins 1974, Sholkowitz 1978, Rendell et al. 1980, Förstner et al. 1989, Wilkins 1991, Coker 1995, Clevenger and Samir 1997), kinetic studies have been highly successful in the evaluation of the potential pollution of rivers by metals. It has been possible, through the results of these studies, to predict metal behavior in natural systems and to prevent possible threats to the environment and human populations. Therefore, kinetics was applied here to study both the release of TEL from sediments to the water column under controlled conditions (T, pH) and the factors that affect that release, specifically pH. The geochemical parameters involved in the kinetic behavior and the contribution of biogenic TEL to the environment were determined with factor analysis. Finally, these results were used to predict the potential toxicity of the Cacalotenango and Taxco rivers to the inhabitants of the study area. Data generated during this study will allowed other scientist or health officials to determine the potential risk that water consumers may face. The hydrological basin studied here (Fig. 1) is located in northern Guerrero, México, between 18° 30' and 18° 33' N and 99° 36' and 99° 40'W 10 km southwest of the city of Taxco de Alarcón. It consists of two main rivers, Cacalotenango (RCA) and Taxco (RTX), that receive mine waste from two tailings (El Fraile and La Concha), one closed mine (Jesús), one active mine (La ConchaRLC), and urban waste from the towns of Dolores, Santa Rosa, El Fraile, and Cacalotenango. Samples from three out of twelve river stations (La Concha River station [RLC], Cacalotenango River station [RCA], and Taxco River station [RTX]) were selected for the kinetic tests because total lead concentrations in sediments were 8 to 30 times higher (RLC 5.8 g kg1, RCA 1.4 g kg1 and RTX 0.9 g kg1) than average concentrations in pristine sediments taken from the study area (ArcegaCabrera et al. 2005, ArcegaCabrera 2006, ArcegaCabrera et al. 2009). They have been previously identified as a potential risk to the environment (ArcegaCabrera et al. 2009), and according to Jarvie etal. (1975), Walton et al. (1988), andRhue etal. (1992) alkylationof lead is favored at sites with high lead concentrations. Samples were collected during the postrainy season, because TEL could reach its highest concentrations during this period. During the rainy and postrainy seasons, TEL could be released into the river's water column via leaching and runoff from the hydrological basin (Nevenca and Branica 1994). Four watersediment samples were collected at every station (RLC, RCA and RTX) (Fig. 1) following the methods proposed by Rubio and Ure (1993) and Loring and Rantala (1992). Every sample collected during the field study, consisting of 1 kg of sediment and 3 L of water, was placed in a plastic container and rapidly transported to the laboratory (transportation time <2 h) in order to avoid significant changes in the in situ physicochemical conditions (Table I). Once in the laboratory, samples were placed in closed containers, and air was bubbled through the samples to maintain water circulation and oxygen levels similar to field conditions (Table I and II). Approximate river flow (Table II) was measured at the river stations where and when water samples were collected (RCA, RLC, and RTX) based on the method of Ficklin and Mosier (2002) assuming a flat river bottom. Temperature was kept constant and similar to field conditions (Table I). The pH was fixed and kept constant at 6.0, 7.0, 8.0, and at field values. Aliquots (5 x 103L) of the overlaying water were sampled at 0, 0.5, 1, 2, 3, 4, and 6 hours and placed in vials at 4 °C in the dark to avoid further degradation via photolysis or TEL formation via microorganisms. Sediment samples were analyzed for Li, carbonates and organic matter content according to the methods described by Loring and Rantala (1992). Temperature (T), pH, and conductivity were measured using a Conductronic PC 18 potentiometer/ conductivity meter calibrated with pH=4 (J. T. Baker, potassium acid phthalate buffer, NIST as RS), pH=7 (J. T. Baker, phosphate buffer, NIST as RS), and pH=10 (J. T. Baker, borate buffer, NIST as RS) buffers, and with a solution of 1000 mg/L of KCl (J. T. Baker, ACS) corresponding to a conductivity value of 1.99 x 103 S/cm. Eh was measured with an Instrulab ORP meter corrected using a Zobell solution (potassium ferrocyanide, and potassium ferricyanide, J. T. Baker, ACS) prepared as indicated by APHA (American Public Health Association 1992). These parameters were continuously monitored to ensure the constant experimental conditions. Determination of tetraethyl lead concentration was done in a diode array HewlettPackard UVVisible spectrophotometer model 8453 equipped with quartz cells (1 cm pathlength). The spectrophotometer was calibrated with a tetraethyl lead standard solution (AccuStandard, Inc. UHP) using a wavelength range of 191 x 109 m to 209 x 109 m; behavior was linear from 0.1 x 107 mol m3 to 8.9 x 107 mol m3. The calibration curve was prepared by taking aliquots of the standard and diluting with deionized water to avoid differences between the samples and the analytical curve's background signals. A relative standard deviation below 10 % was achieved by repeating the calibration curve 6 times. After samples had settle down, the water without suspended solids was placed in the quartz cells to measure TEL concentrations. This measure was repeated 3 times in 10 randomly selected samples (12 % of the total population) and a relative standard deviation below 10 % was achieved. Detection limit was 0.8 x 10 8 mol m3. In situ conditions of pH, Eh, conductivity, organic matter, and carbonate content are shown in table I. The role these parameters played in the observed TEL release behavior is discussed later. The average range of TEL in other regions impacted by mining is 6.1 x 108 to 8.58 x 107 mol m3 (Nevenca and Branica 1994). 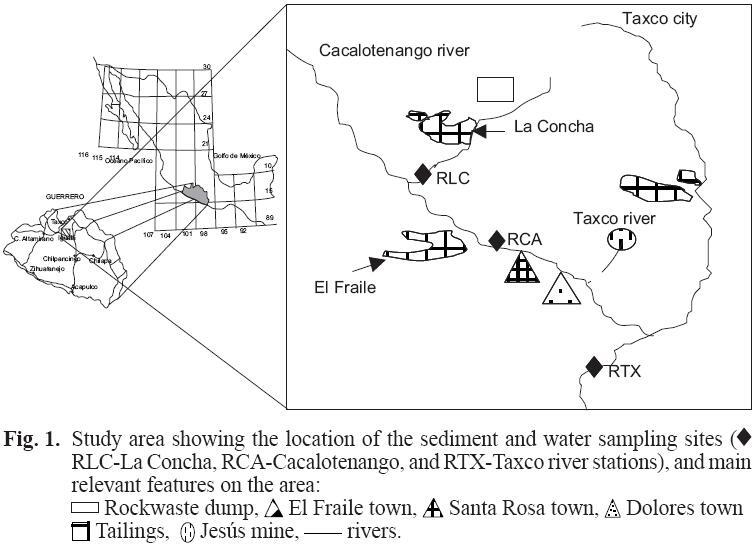 In the Taxco river basin, the range observed at the three sampling stations was 0.3 x 107 mol m3 to 8.5 x 107 mol m3. Results of the kinetic experiments are shown in figures 2, 3, and 4. Significant changes in released TEL were observed among samples and experimental pH values. For example in samples from station RLC (Fig. 2), water column concentrations increased with decreasing pH. This behavior could be explained by the low content of organic matter (29 g kg1) present in the sediments. Organic matter functions as a stabilizer of the highly hydrophobic TEL molecules, and it is probable that TEL can only be adsorbed onto a limited number of lithogenic particles. This adsorption is relatively weak and can be easily affected by slight changes in pH and redox potential. Importantly, methylation increases the amount of metal compounds dissolved in water because it weakens the adsorption of the metal compound onto the substrate (Thayer 1987). In samples from RLC, TEL concentrations exceed the US EPA's recommended safe limit of 0.46 µmol m3 at pH 6.0 (Fig. 2) (Irwin et al. 1997). Therefore, an acid mine drainage release (AMD) from La Concha mine would increase acidity and TEL concentrations in the water column. Such a concentration increment would have the potential to increase toxicity and risk for the local population. In contrast, Fig. 3 shows that at RCA the released concentrations of TEL are lower, and at in situ conditions TEL concentrations in overlying water are not detectable. This could show that TEL concentrations are lower per se at RCA than those at RLC. Only at pH 6.0 and after 2 h did the concentrations reach and exceed the US EPA's safe limits (Irwin etal. 1997). Both the organic matter content (24 g kg1) and TEL concentrations are lower at RCA than at RLC. Lower TEL concentrations could be explained by: 1) the presence of a higher number of active sites in the RLC sediments, which may prevent TEL release; 2) the organic matter content in the suspended solids (OMSS >850 g kg1) at RCA may be capturing TEL present in the water column since, according to Mulroy and LiTse (1998), a high concentration of organic matter or hydrocarbons in particulate material capture and isolate TEL from direct contact with the water column; or 3) lower TEL concentrations in RCA sediments than in RLC. Therefore, an initially lower concentration of TEL at RCA and the influence of particulate matter, as well as organic matter content in the sediments could explain the differences between the two stations. At RTX (Fig. 4), TEL release rates from the sediments are similar to those found at RCA. At pH 8.0 the concentration remains constant without a significant TEL release. Here, the higher organic matter content in the sediments (44 g kg1) may be functioning as stabilizer of TEL. Nevertheless, at pH 6.0 the concentration at RTX is higher than at RCA, which contradicts the expected behavior if the content of organic matter in sediments is taken as an indirect measure of the sediments' adsorption strength toward TEL. Any explanation of these data must take into account our limited understanding of the distribution of the alkyl compounds between the dissolved and the particulate phases in natural aquatic systems. The presence of urban wastes (labile organic material with more active adsorption sites) in the Taxco river results in a significant amount of TEL being adsorbed to the organic covers of the particulate material (Nevenca and Branica 1994). Consequently, TEL at this station could be released from sediments but more significantly from the particulate matter. Finally, factor analysis (Table III) indicates which geochemical characteristics of the sediments affect TEL behavior. Four factors explain 93 % of the total variability. The first factor groups TEL concentrations only. In the second factor, suspended solids (SS) and organic matter in sediments (OMsed) show an inverse relationship with the first factor. This relationship demonstrates that an increase in the organic matter content in the sediments diminishes TEL release and corroborates the previous discussion. The relationship of SS with the third factor, which includes total Li, OM in the suspended solids, CaCO3 in sediments, and an inverse relationship with dissolved oxygen, suggests that Li concentration in the sediments is directly related to TEL concentrations, suggesting transport of TEL via runoff. Moreover, there is an inverse relationship with SS because most of the suspended solids are formed by inorganic material leached from the hydrological basin in the postrainy season. This significant relationship suggests that an important source of TEL could be the hydrological basin leaching. This is corroborated by the significant relationship of OMSS with TEL, which suggests that TEL could be present and cotransported on the organic particles of suspended material present in the water column. It could also remain suspended depending on the river flow conditions. The relationship between carbonate (CaCO3) content in the sediments and TEL concentrations shows a significant dissolution of carbonates with a decreasing pH (ArcegaCabrera 2005), which releases TEL to the water column. Brinckmann and Olson's (1987) finding that acidity is a primary factor in promoting the release of alkyl compounds to the water column lends further support to this conclusion. The direct relationship between factor 4 (which groups Eh and conductivity) and factor 1 indicates that redox changes may affect TEL concentration. Under oxidizing conditions, TEL could be released from the water column because fewer organicmatter bonding sites are available for TEL adsorption in an oxidized sediment. 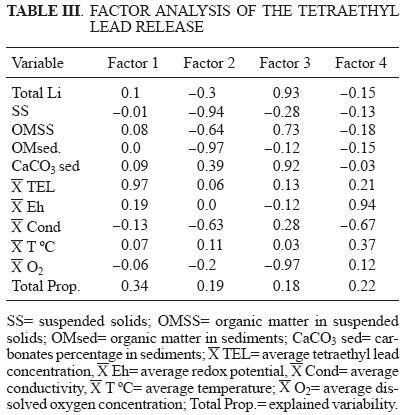 Tetraethyl lead's inverse relationship with conductivity in factor 4 evidences a competition for adsorption sites in the particulate matter between TEL and other ions present in the water. Consequently, if conductivity increases, TEL will tend to stay in the sediments. Temperature and oxygen concentration are indirect parameters that reflect microbial activity in relation to TEL contents in sediments. The lack of a relationship between TEL and temperature and its inverse relationship with oxygen show that microorganisms probably did not participate in the formation of TEL. Thus, if an in situ formation of TEL happens in the area it could be due to chemical reactions forced by changes in pH. In conclusion, these data showed that in a closed controlled natural system, under changing pH conditions, there is a release of TEL from the bed river sediments to the water column. In the sampling station down river of an active mine and a tailing, the released TEL at pH 6 or below, almost instantly, exceeded the US EPA's recommended safe levels and, hence, is a potential risk to area residents that use this water. The data also illustrate that the complex geochemical characteristics of the sediment and the pH of the water column interact to control the behavior of TEL. It is possible that TEL enters the water column via wet deposition, runoff, and leaching of the hydrological basin. Although this study evidenced an increase of tetraethyl lead concentration in the water column under pH changing conditions, further research is needed to evaluate tetraethyl lead concentrations in sediments and possibly in biota. The authors thank Dr. Óscar Talavera Mendoza and the Escuela de Ciencias de la Tierra, Universidad Autónoma de Guerrero for allowing us to use their laboratory facilities and Dr. Juventino García Alejandre for his help in treating samples. F.A.C. thanks CONACyT for a scholarship that helped fund this research. Funding was also provided by the CONACyTSEMARNAT C0 100172002 project.